Part I: Starting and Playing the Game. Chapter 1. Tackling the Basics of Backgammon. Chapter 2. Playing the Game. Chapter 3. 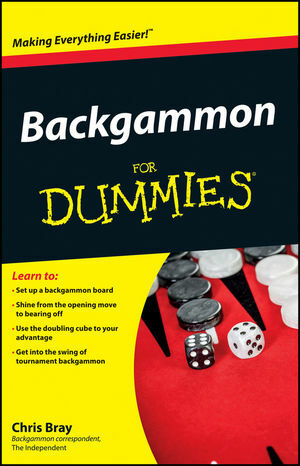 Looking at Basic Backgammon Tactics. Chapter 4. Making the Opening Move. Part II: Handling the Middle Game. Chapter 5. Upping the Stakes by Doubling. Chapter 6. Progressing to Advanced Doubling. Chapter 7. Planning Tactics for the Middle Game. Part III: Bearing Off (The Last Lap). Chapter 9. Bearing Off without Contact. Chapter 10. Bearing Off Against Contact. Part IV: Varying the Play. Chapter 11. Looking at Complex Endings. Chapter 12. Entering the Chouette. Chapter 13. Playing Tournament Backgammon. Chapter 14. Using Computers and Online Play. Chapter 15. The Ten Commandments of Backgammon. Chapter 16. Ten Useful Backgammon Resources.